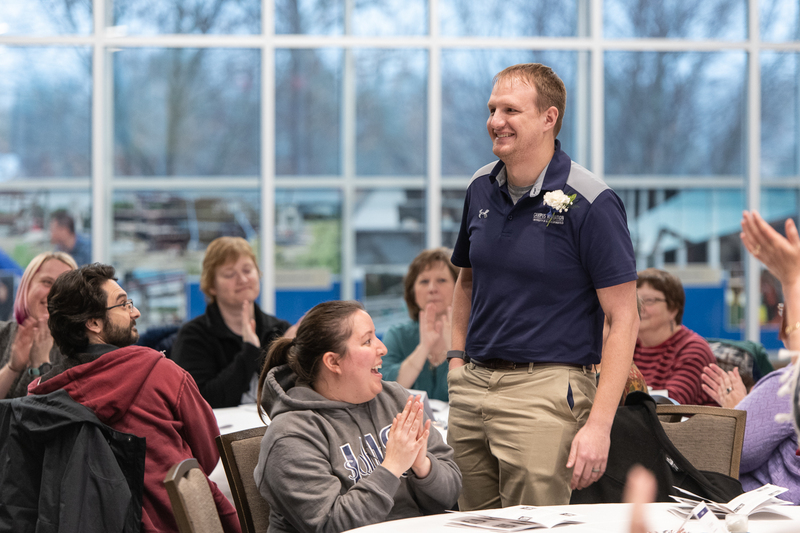 Jay Swenson, assistant director of competitive sports and facilities for Campus Recreation, has been named the 2018 Employee of the Year at the University of Illinois Springfield. He was honored during a reception on February 6, 2019, in the Student Union Ballroom. Before announcing the winner, UIS Chancellor Susan Koch thanked the eleven Employees of the Month who were nominated for the award. According to his nominators, Swenson continually works to improve the areas he oversees, such as intramural sports, by listening to students and coming up with new ideas. In April, he created an event called Rec Madness in order to bring more attention to the intramural basketball championship games. He also helped to bring back intramural softball, which hadn’t been played on campus in four years. As Employee of the Year, Swenson will receive a check for $500, plus a special parking spot for the entire year.